For those who are enamored by the world of CBD and constantly hearing how it helps cure myriad health conditions, you must be left wondering how it might work on bigger conditions, like diabetes. As there isn’t sufficient medical evidence, we can only say from the few which have been carried out. According to Dr. Allan Frankel of Greenbridge Medical, who has been treating diabetes patients with CBD Oil, he professes that CBD oil helps not only in the treatment of diabetes but also sufficient management of secondary conditions related to diabetes like joint pains. What is Diabetes and how can CBD help it? Diabetes is a condition wherein the body is unable to regulate the level of sugar (glucose) in the bloodstream. Normally, the pancreas produces a hormone called insulin, and this works to transport all glucose molecules across cell membranes for energy production. In the case of diabetes, the body is unable to produce sufficient insulin and use it to maintain glucose at a healthy level in the bloodstream. This can wreak havoc to your system with many life-threatening conditions. There are two type of diabetes, Type 1 and Type 2. Type 1 diabetes is seen in kids or young adults when they contract a pancreas-attacking virus, and the body is no longer able to produce insulin, however, there are not many specific risk factors. Type 2 diabetes is a more prevalent form of the disease with an estimated 400 million people worldwide suffering from it. Dr. Raphael Mechoulam, a research scientist from the Hebrew University of Jerusalem, points to the fact that naturally-occurring CBD receptors occur throughout the human body – from the brain and nervous tissues to organs, endocrine glands, pancreas, and immune cells. The best part is that the endocannabinoid receptors (namely CB-1 receptors) have been found in pancreas’ islet cells – the exact location where insulin is produced. However, it is unknown if endocannabinoid receptors are directly responsible for the production of insulin. Hence much more research needs to be done however preliminary studies on CBD for diabetes have been so promising. Insulin resistance happens when the body’s cells reject insulin, and they cannot absorb glucose which is needed for energy. This causes glucose to build up in the bloodstream thereby resulting in high blood sugar levels. CBD’s powerful anti-inflammatory properties help by preventing chronic inflammation as there is a connection between chronic inflammation and insulin resistance according to studies. Lack of inflammation improves cell growth and sugar metabolism. Obesity is a major risk factor for type two diabetes. Usage of hemp and cannabis has been linked to a lower BMI and decreased obesity levels. If you are curious as to how CBD contributes to weight loss, it helps suppress appetite, prevents overeating and contributes to something called fat browning. (white adipose converted to brown adipose). This brown adipose improves energy-burning capabilities. As known to all, skin conditions are dangerous and a pain during diabetes. Any untreated skin conditions tend to aggravate and result in complications. Issues with skin in diabetes include ores on the feet and rashes on various parts of the body.CBD is known to heal skin conditions and provide relief to diabetics with prevention of itching, and any complications which might arise. Many people report that CBD-infused lotions and creams are also highly effective for those who want a more targeted treatment method. This one, backed by Dr.Harvard Medical School’s Dr.Peter Grinspoon reviewed the potential of CBD to improve blood sugar. This article, based on a study conducted by researchers at Harvard, stressed that cannabis can directly help regulate blood sugar levels and body mass index, crucial in diabetes treatment. According to the 4,500+ patients reviewed, consistent CBD users reported that they noticed a 16% reduction in fasting insulin levels and 17% decrease in insulin resistance levels. What added an icing to the cake was a significant reduction of waist circumference. Thus, a ‘significant link’ exists between the regular use of cannabis and better blood sugar levels. Last but not least, with CBD the adage “Prevention is better than cure” couldn’t hold better. People who use hemp on a regular basis have a better fasting insulin levels that are 16 percent lower than participants who had never used cannabis. 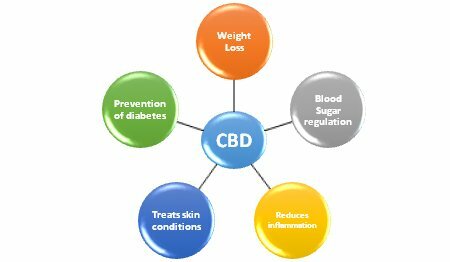 Weight loss, inflammation prevention, and sugar level regulation right from the time you use CBD help you prevent and keep diabetes at bay. The wonderful medical benefits are sure to offer an insight into how incurable diabetes can be managed better with more and more funding being poured in on diabetes research. The news from the CBD world seems to be only getting better as more diabetics are obtaining relief from the conditions of diabetes thereby improving their quality of life.